9.5 to 18 VDC, 0.012 amps nominal. Solid state sensor solid potted with polyester or epoxy resin. Four meters (13 feet) of cable provided. Repeatable accuracy is +/- 1.5 deg. C (+/- 2.7 deg. F). 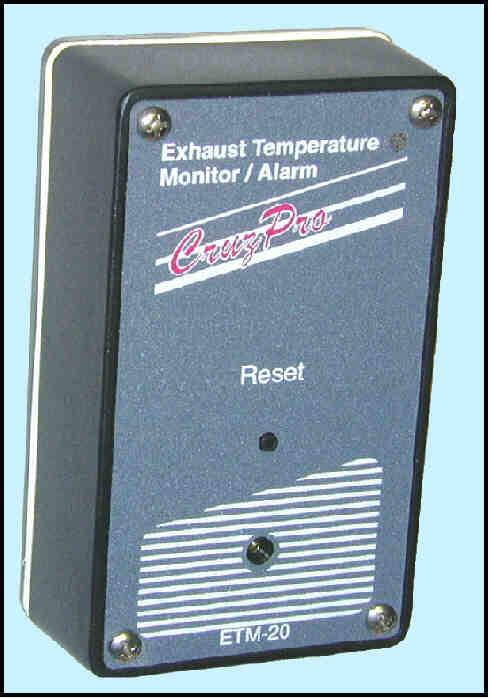 The ETM-20 Engine/Exhaust Temperature Monitor and Alarm uses modern electronics and a reliable solid state temperature sensor to accurately monitor the temperature at any point it is attached. The alarm is factory pre-set at 90 degrees C (194 deg F) but can be easily adjusted with a small screwdriver over a range of 50 deg C to 125 deg C (122 to 257 deg F). When the ETM-20 detects an over-temperature condition it sounds a built-in 85 dB audible alarm. The alarm will continue to sound for the duration of the out-of-limit condition, or until the reset button is pressed. If the alarm is silenced by the use of the reset button, the ETM-20 will automatically arm itself again as soon as the temperature falls below the alarm set point. The ETM-20 draws only 0.012 amps at 12 VDC and can be connected to an external alarm (LA-20) to provide 105 dB of volume, if desired.